Does anybody have any information about this 2 stallions? A friend bought a filly with the above stallions in her pedigree, from Silverdoon Stud in dorset(?) 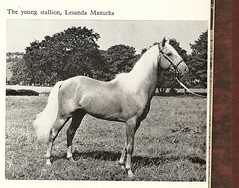 a long time ago and this mare has produced many foals in sweden by arab stallions.Any information welcome. Found a picture of Lesanda Mazurka whilst looking through an old H&H (24 May 1968). It's a for sale advert and I put his details on http://www.allbreedpedigree.com/lesanda+mazurka on Allbreed. I have also added 4 of his off-spring from PBAR VIII all bred by Mrs D. Lees..
Also found Muston Sucre in PBAR VIII. Breeder Mrs F. E. G. Betty. I have put his details here http://www.allbreedpedigree.com/muston+sucre. Silverdoon Stud, Motcombe, Dorset has got an advert in an old Pony Stallion Book I got. There is a picture of one cream stallion but it doesn't say which one. They stood several Cream and Leopard Spotted stallions. Owners Mr & Mrs Willard. He was also known as Sucre (of Silverdoon). I was at the Silverdoon stud in about 1975 or 76, and saw all the cremello stallions at stud. They had Sucre, and 2 cremello welsh stallions and a very nice stallion called Mosell of Silverdoon (reg. as Culverwood Sparkling Mosell). We bought a palomino/spotted filly by Mosell out of a mare by Spanish Steps of Silverdoon (spotted andalusian cross). I remeber that that I was told that Silverdoon stud bred and sold a lot of horses and ponies (palomino and spotted) to circuses all over Europe. 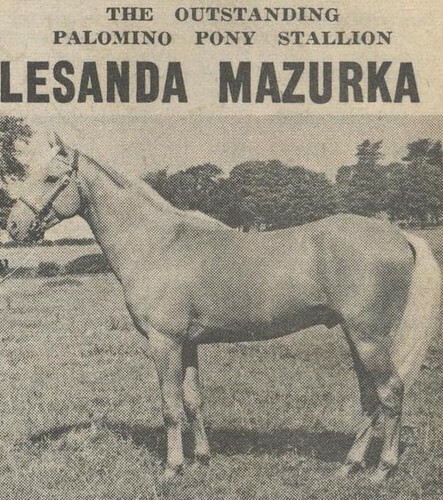 Here is another picture of Lesanda Mazurka from an old palomino magazine.